The onslaught of mid-summer rain has not only caused sporadic flash floods and scenes of highway underpasses turned into lakes. The downpours have also drenched the city’s overburdened sewage system. Not counting today’s deluge, more than 8 million gallons of untreated sewage have gushed into the Jones Falls since July 1. Today the Department of Public Works released data on the latest sewage dump, which followed a fast-moving thunderstorm last Saturday. Nearly 450,000 gallons of rainwater-laced sewage were released into the Jones Falls from two underground conduits – one at 428 East Preston Street (just east of the JFX) and the other at Charles and Lanvale streets (just north of Penn Station). 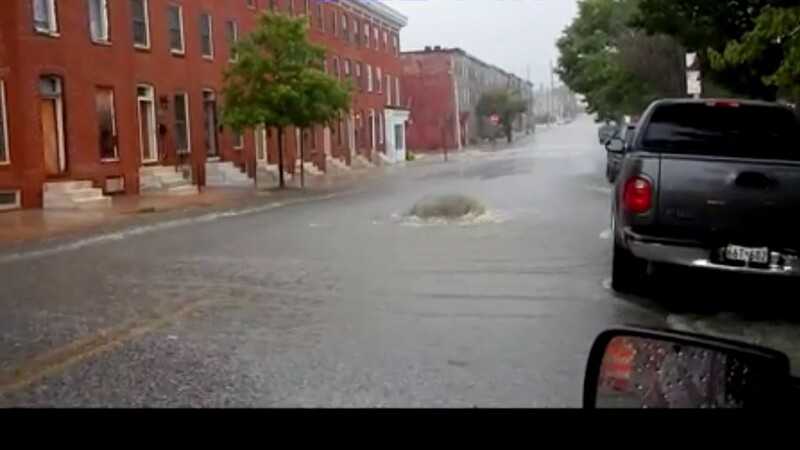 An additional 1,500 gallons backed up on Garrison Avenue in Northwest Baltimore, DPW said. The Saturday cascade came days after Mayor Catherine Pugh approved a modified consent decree with federal and state regulators promising to stop dumping sewage into local waterways by July 1, 2022. The city says sewage-less streams will dawn with the completion of a $400-million-plus modernization of the Back River Waste Water Treatment Plant. There will be a large increase in storage capacity and the 100-year-old headworks will be totally rebuilt. With improved hydraulics at Back River, DPW says, there will be no need to use the Jones Falls as a safety valve when rainwater infiltrates and inundates the main sewer lines. Last week’s agreement replaces a 2002 consent decree that also called upon Baltimore to end sewage overflows into Jones Falls in order to comply with the 1972 Clean Water Act. The city was supposed to get that work done by January 1, 2016. But the timetable was dramatically altered when DPW concluded that it could only make the system work with a re-engineered headworks – an endeavor whose construction has just begun and isn’t expected to be finished until 2021-22. In handling excess sewage flows between now and 2022, city officials like to stress that there are only two places where the liquid is typically disposed – at the East Preston location and on Falls Road near the Baltimore Streetcar Museum. The new consent decree, however, lists 13 “SSOs” (structured sanitary overflows) yet to be closed by the city. Half of them are located at higher elevations in Northwest Baltimore, such as the 3100 and 3200 blocks of Liberty Heights Avenue and the intersection of Garrison and Queensberry avenues. They serve as escape hatches for excessive build-up of sewage caused by failures in the system or sudden downpours. Unfortunately, about 5,000 homeowners a year are casualties of Baltimore’s old and failing sewers, faced with wastewater that back-flows into their toilets and drains, often leaving a putrid residue in basement dens and bedrooms. One area where sewage sometimes flows squarely into the street is along Eager and Chase streets north of the Johns Hopkins Medical Complex. DPW describes the most active site, on the 1800 block of East Eager, a “monitored manhole.” And when sewage blows out of that manhole during or right after a heavy rainstorm, it’s a sight to behold. Two weeks ago, on July 28, more than 589,000 gallons of brownish liquid spewed into Eager Street from the manhole. It slowly drained into nearby stormwater drains and was emptied into the harbor near Fells Point. Given the amount of rain that fell today, DPW’s next overflow report should be brimming with trailing zeros.